MEXICO CITY, Feb 20 2012 (IPS) - The largely invisible work of small local groups of indigenous farmers in Mexico who are spearheading the defence of their territory and identity and of native seeds is strengthening ecologically sound family farming, experts say. By this means he has been able to identify, for instance, the actions of at least 50 local indigenous or mestizo (mixed ancestry) groups, and at least 150 corn festivals celebrating maize, a staple food that is traditionally revered in Mexico and Central America. Barrera has identified the main leaders of community projects, including women, Catholic Church social action groups and elders. “We have won the confidence of the people, who are receiving technical advice and information about their rights, for both men and women,” Claudia López, an accountant for a coalition of community organisations in the southern state of Oaxaca, told IPS. “We are concerned about food security and sovereignty, so that people can grow what they eat, and about water, gender issues and natural resources,” she said, with respect to the focus of the activities of the Sierra de Juárez Union of Organisations (UNOSJO). UNOSJO, founded in 1992, is made up of 12 indigenous communities, whose members have learned agroecological practices and apply them in coffee, vegetable and maize cultivation as well as in rearing small livestock like pigs and chickens. The producers export certified organic coffee to Germany, as well as meeting their own needs. The basis of these initiatives is the family farm, regarded as essential for weathering the environmental, economic and nutritional crisis affecting this Latin American country. In Mexico, family farms with an average area of six hectares apiece provide the livelihood of five million people, out of a national population of over 112 million. They supply 39 percent of total national agricultural and livestock production and provide 70 percent of agricultural jobs, according to the Food and Agriculture Organisation (FAO). In December 2011, the United Nations General Assembly declared 2014 the International Year of Family Farming, in recognition of the key role of small farms for supplying food and incomes to billions of peasant farmers all over the world. 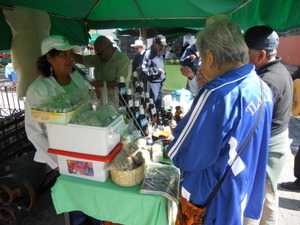 Securing a supply of healthy food, free from chemical additives and other pollutants, is the focus of a group of women who created the Comida Sana y Cercana (Healthy Local Food) Network of Responsible Farmers and Consumers in San Cristóbal de las Casas in the southern state of Chiapas in 2005. The organisation comprises 32 families producing coffee, maize, vegetables, wheat, and small livestock. “We decided to take action to ensure that the food we brought home was healthy,” Lourdes Pérez, one of the group’s leaders, told IPS. “We started to investigate and we found that some farmers were growing crops organically, using spring water and no chemical inputs. “Then we started the organic food basket, a system for people to place orders from a list of products that the group markets collectively,” she explained. Members of the network set up their stalls on Wednesdays, Fridays and Saturdays at a market established in 2007, to sell their food to local consumers. At first they had 15 products for sale, but the variety has now increased to over 50 kinds of food. In 2011 the Comida Sana y Cercana network started a participative certification process to validate the agroecological practices of its members. As a result, this February they are about to issue their first endorsement, to a family that produces avocado pears and other fruits, and raises small livestock. The producers and consumers’ organisation also belongs to REDAC, the Mexican Network of Organic Markets and Tianguis (street markets), founded in 2004, which has 20 markets throughout Mexico that foment close links between rural producers and urban consumers. These organisations promote markets that drive local production and consumption of organic foods, and contribute to raising awareness of the ecological and social importance of responsible production and consumption. Another 18 markets are in the process of joining REDAC. One of the driving forces behind the local organisations has been their opposition to the use of genetically modified seeds, especially maize. Since 2009, the ministry of agriculture has received 110 applications to plant genetically modified maize in experimental plots, 67 of which have been authorised, along with 11 pilot projects on a somewhat larger scale. Transgenic crops of cotton, soy and wheat are also being grown, with wheat so far only being planted in experimental plots. On his ecopolitical map of Mexico, Barrera has identified 22 priority regions for native maize cultivation, of which 11 are threatened by signs of transgenic contamination. “Our concerns are issues like mining and protecting natural resources,” said López, whose organisation belongs to the Network for the Defence of Native Maize. In four Oaxaca communities, UNOSJO is building rainwater collection systems to help cope with drought. The Sierra de Juárez Union has received funding from two U.S. groups, the CS Fund and Warsh-Mott Legacy and Grassroots International, and from the German agency Brot für die Welt (Bread for the World). “The toughest challenge is to redirect demand so as to elicit ecologically sustainable production,” she said.